GO Enerji has an important reservoir in the field of solar energy with its experience since 2003 and even scientific based works. With the benefits of watching closely the international sector, the political developments and all the commerce world, it has the ability to direct the investor in all means. Until today it has done numerous technical and commercial evaluations for projects. The energy systems that it offers with its deep knowledge and superior engineering skills, can produce ore energy than its rivals. This advantage comes back to you as earnings. 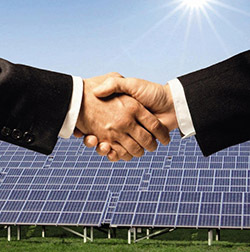 The Solar Power Plants are planned and installed on various fields specially. Contrary to the beliefs, the weather conditions and more sunlight doesn't mean that the investment will be more profitable. It can be necessary to choose special, different works and even other, more suitable technologies. Even the wavelength of the sunlight reaching a field can affect the productivity of the investment. Therefore, not every product is suitable for every field. A right evaluation and consulting are important. You will have the maximum earnings from your investments with our team consisting of experts on technical, financial and legal points of view with their experience and education of many years.